The Global Coral Reef Alliance is deeply saddened to report the loss of our great friend and leading Balinese partner, Agung Prana. Bapak Agung Prana’s constant support for Biorock projects over 20 years made Bali the world center of coral reef regeneration. The photo below shows a photo of Agung Prana held by his son, Bagus Mantra, surrounded by the leaders of the Biorock Bali team. I Gusti Agung Prana, age 70, passed away Friday, July 6th, 2018 at the Wing International Sanglah Hospital Bali, after a long illness of cancer. 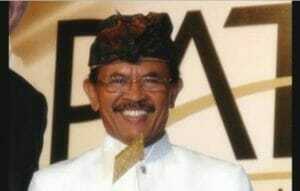 Mr. Agung Prana, our beloved father was born July 12th, 1948 in Mengwi, Bali. He is survived by his wife, I Gusti Ayu Arini, one daughter, I Gusti Agung Desi Pertiwi, and two sons, I Gusti Bagus Mantra and I Gusti Ngurah Kertiasa. He was a dedicated man who served his life for Bali Tourism since the late 60s. He has had a chance as Vice President of Bali Tourism Board and Chairman of the Association of Indonesia Travel Agencies (Bali Chapter). His last 3 decades was devoted to sustainable eco-tourism in Pemuteran, North Bali restoring degraded marine ecosystems through biorock reefs method. He was a founder of Karang Lestari Foundation and worked together with the spirit and culture of the local people, changing poor areas into a high visited tourist destination. This brought Pemuteran gained many international and national awards such as Tourism for Tomorrow Awards – Finalist (2018), The Equator Prize of UNDP (2017), Best Sustainable Tourism Development of Indonesia Tourism Ministry (2012), Tri Hita Karana Award (2011), PATA Gold Award (2005), and Best Underwater Ecotourism Project of SKAL International (2002). On behalf of family members, Mr. Bagus Mantra apologized for all the mistakes of his father. He conveyed that funeral services (Plebon ceremony) will be conducted on Saturday, July 21st, 2018 at the Jero Gede Bakungan, Umabian, Peken Blayu Marga, Tabanan Regency. Friends may call at the funeral home Saturday morning from 7 to 9 a.m. or one hour prior to the services.